Looking for a great side dish for your Thanksgiving meal? Celebrate the holidays and year round with this tasty, healthy and easy to make side dish! Apples and sweet potatoes are rich in health supporting nutrients and have anti-inflammatory properties. Fight cancer in the kitchen! Apples are a nutritional powerhouse. They are a known source of disease fighting vitamins, minerals, phytonutrients, and dietary fiber. Apples have disease fighting, anti-inflammatory and antioxidant properties. Sweet potatoes contain a host of carotenoids which are great antioxidants, and have disease preventive as well as immune supporting properties. Sweet potatoes are also a great source of dietary fiber, vitamins and other phytonutrients. Cinnamon has historically been used in herbal medicine. It has many health benefits including antibacterial, anti-inflammatory and antioxidant properties. Continue the cancer fight at your holiday table! 2. Peel and slice sweet potatoes; slice apples (peeled or unpeeled). 3. 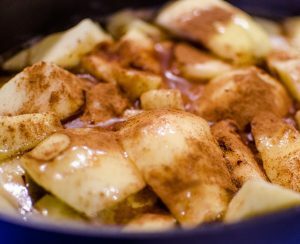 Place apples, sweet potatoes, ghee, cinnamon and water in a glass baking dish or casserole. 4. Mix until apples and sweet potatoes are evenly coated. 5. Cover with foil and bake for 30 minutes – stir/mix apples and sweet potatoes after 15 minutes. 6. Remove foil after 30 minutes and stir. Put back in the oven for an additional 15-20 minutes or until the sweet potatoes are tender. Stir again mid-way through baking. 7. Remove from oven and let stand for a few minutes. 8. Add a dash of sea salt if desired and/or garnish with cinnamon sticks to spruce up the look of your dish.